Watch Ya' Mouth Family Edition Just $14.99! Down From $20! You are here: Home / Great Deals / Amazon Deals / Watch Ya’ Mouth Family Edition Just $14.99! Down From $20! Watch Ya’ Mouth Family Edition Just $14.99! Down From $20! This is a great game you can play with the family! Get Watch Ya’ Mouth Family Edition at Amazon for only $14.99 down from $19.99 PLUS FREE shipping with Amazon Prime or for orders over $25! 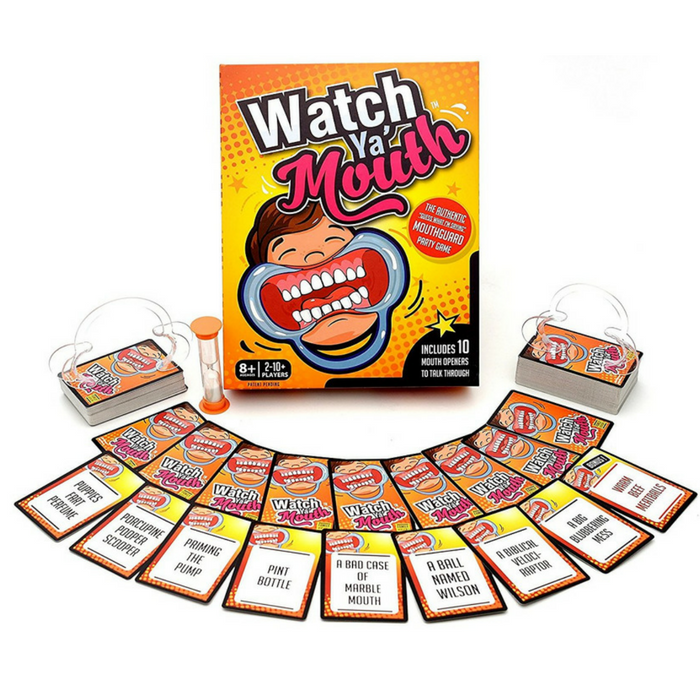 Watch Ya’ Mouth, Hilarious, Mouthguard Party Game. Watch Ya’ Mouth is a must for any gathering, party, game night, or family night. The mouthpieces are FDA and CE certified, cards are thick and durable, and the community is second to none. With a variety of phrase packs available, ranging from Family-Safe to Adult-Only, there’s something for everyone. Be warned: Stomach-Cramping, Eye-Watering laughter is a very frequent occurrence. ” One of the funniest party games there’s been” Learn it in seconds, play it for hours, and create lasting memories with your friends and family. This is perfect for family gatherings or just a family bonding! AS SEEN ON TV: Featured card game on Good Morning America, Buzzfeed’s “The Try Guys” & More!